All cellular phenomena are implemented by chemical reactions of diverse molecules with small numbers being encapsulated within a microscopic cellular environment. 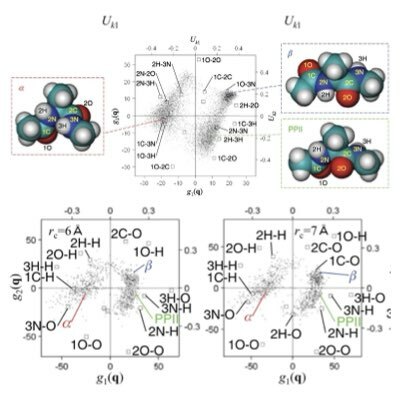 How should we describe and model stochastic behaviors of the molecules? How can the small number of molecules induce qualitative transition? What kind of thermodynamic law does an equilibrium / non-equilibrium intracellular reaction system follow? We address these fundamental questions and develop methods for their verification using quantitative data. Intracellular reactions composed of a variety of different molecules are intrinsically stochastic, because of the small copy numbers of individual molecules. 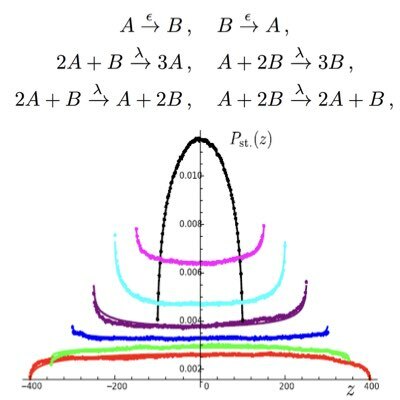 Stochastic modeling and thermodynamics are indespensable for understanding how robust cellular functions emerge from these diverse yet rare molecues (Learn more: , ). A potential constructive role of stochasticity is to bias certain cellular phenomena from the average behaviors. While an averaging effect simply impairs celullar functions in most cases, we have found that stochasticity can substantially amplify an input signal via cascading reactions with a specific network stucture (Learn more). In some caces, noise and fluctuation can work as a driving force to induce tranditions in a microscopic system. Noise-induced phenomena may explain why and how biological systems can operate in an ordered manner with noisy & stochastic components. Towards this end, We have discovered a new type of noise-induced transition termed “discreteness-induced transition”, which originates from the discrete nature of inracellular reactions (Learn more). In intracellular networks, individual reactions work concurently as the sources of stochasticity and channels to propagate signals and noise. 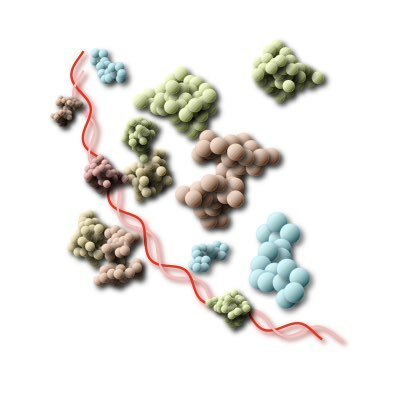 Understanding the origin of stochasticity in cellular systems requires the development of tactical methods that can appropriately dissect these two different roles of reactions. 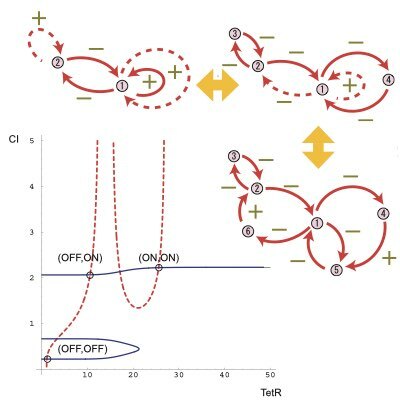 By extending the dual reporter system introduced by Swain and Elowitz, we proposed a conjugated feedforward and feedback system to estimate feedback efficiency simply based on the statistics of the target and conjugates molecules (Learn more). One fundamental difference between non-living and living systems is the ability of self-replication, which can function as a driving force to maintain the non-equilibrium state of living systems. However, it remains unknown as to whether this non-equilibrium state driven by self-replication differs from the typical non-equiriburim state of non-living systems sustained by flow of material or energy. To tackle this question, we are working toward establishing a thermodynamic description of self-replicating systems. 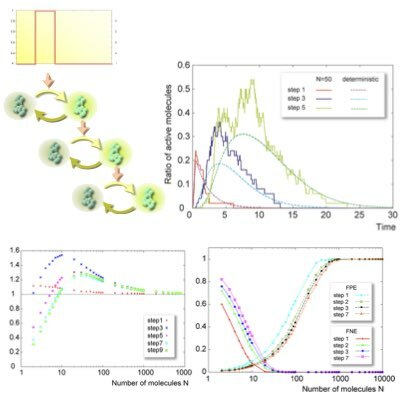 Delay is another ubiquitous phenomenon in intracellular networks, which can drastically change the stability of the networks depending on their structures. We clarified that the asympototic behaviours of genetic networks only consisting of positive feedback loops cannot be altered by any delay in the network, which provides a sufficient condition to construct stable genetic switches. We also proposed a method to design stable synthetic switche by extending a simple abstract network with required stability to more complicated networks (Learn more). Oscillation is a dynamic component of living systems to coordinate and synchronize different intracellular processes. 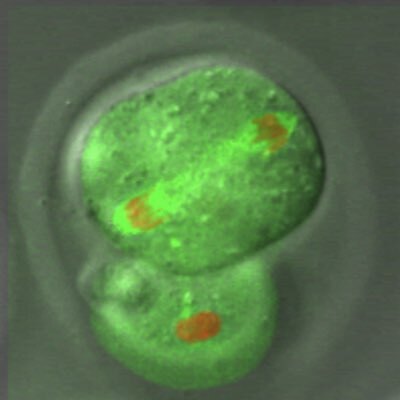 Thus, the design and control of oscillatory dynamics in a cell is relevant for modulating the global states of the cell. 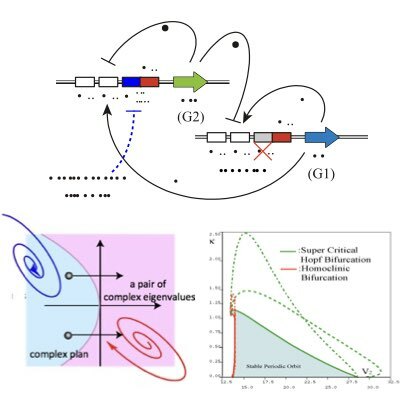 By employing the bifurcation theory, we proposed a method for the design of robust synthetic oscillators using genetic networks. The conformational structure of a protein and its fluctuations are the key determinants of its functionality. Therefore, the reasonable control and design of a structure are fundamental for molecular engineering. However, it is still elusive how we should measure the difference of protein structure for this purpose and how we can induce large structural changes under that measure. In this work, we propose using Kullback Leibler divergence of conformational fluctuation as a standardized measure of structural differences. 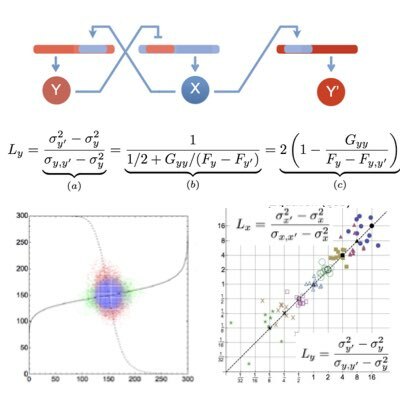 By exploiting an underlying information-theoretic structure, we proposed a method to predict the optimal perturbation that can induce the largest change of conformational fluctuations to a protein (Learn more: , ). Copyright 2018 Tetsuya J. Kobayashi. All Rights Reserved.